Rhodes, Greece is a UNESCO World Heritage Site and popular tourist destination located twelve miles off the coast of Turkey. Besides going to the beach and nearby archaeological sites, most cruise visitors will be happy spending the day meandering around one of the best preserved medieval towns in Europe. I spent the day on a self-guided walking tour of the medieval city, and returned at night for a Cruise Global, Nights Local tour of Old Town Rhodes. One of the best things about sailing with Azamara Club Cruises is that they stay in port longer, which allows guests to explore by day and night. Now, if you think about it, most cruise ships leave port in the early evening – not Azamara. Old Town Rhodes offers cruise passengers plenty of attractions: a palace, museums, souvenir shops, restaurants, bars, a hamam, and medieval walls that can be scaled to enjoy great views of the surrounding area. My goal was to make it to the imposing fortress that dominates the highest point of the city: The Palace of the Grand Masters, built in the 14th century by the Knights of St. John. During my self-guided walking tour of the medieval city, I stopped by an uncrowded restaurant and had ample time to meander the labyrinth of streets before heading back to the ship for an afternoon at the The Sanctum Terrace. At about 7:00 p.m., a small group of twelve people left the Azamara Quest and headed into the city for a guided walking tour - this was a great alternative to touring during the day (although you could do that as well). Walking through the streets of Old Town Rhodes at night was a great experience; definitely a cruise highlight. It was an absolute pleasure to explore by night without the hassle of dealing with crowds (Azamara Quest was calling just at the end of the busy tourist season). 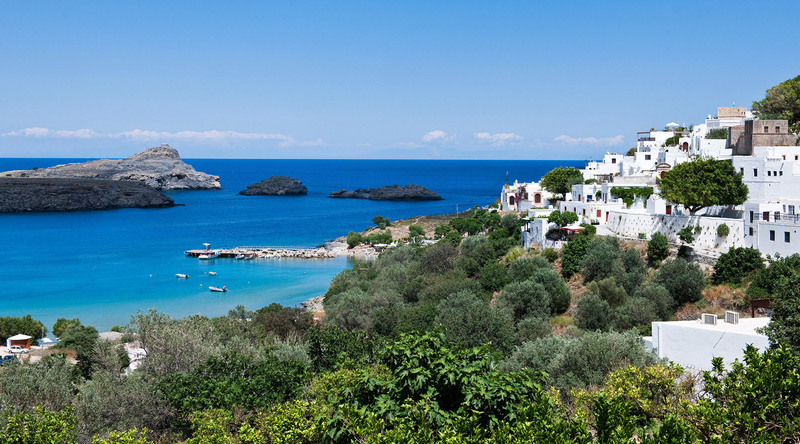 About 15 minutes into the tour, I got really excited because I realized that although I could easily figure out the town, I lacked key details about the architecture and history of the capital of the Dodecanese islands. Without a guide, it was easy for me to miss Destination Immersion® details that I needed to understand the significance of the area. Although I was very happy with my self-guided walking tour of Rhodes, it was not until I was on the Cruise Global, Nights Local tour of Old Town Rhodes that I realized that I was missing critical context. Our local guide Dēmḗtrios was amazing and his breadth of knowledge of the history of Rhodes was impressive. After a narrated walking tour, I was left much more informed. We walked the streets of Europe’s oldest inhabited medieval town learning about the people, shops, boutiques, galleries, workshops and cafes that have been in the area since the 14th century. We walked up the Street of Knights, learning how the missionaries defended themselves from Ottoman attacks in 1480 before finally falling siege in 1522. We continued along the streets before heading to Romeo Restaurant for some Greek hospitality. When I combined my early information gathering expedition with the guided tour, I finally had a clear picture of how enchanting Rhodes is. Bottom line: I was happy that I explored on my own and then followed that with a tour that enabled me to see the city at in a different perspective.